What’s with all the Freemason symbolism and homage in this podcast? These two guys freak me out – Adam Curry and John C Dvorak. Early this year, I bought two USB speakers a few days apart. (One was a JBL Micro and the other a Reliance Digital private brand). In the next podcast of the No Agenda Show, Dvorak constructs a situation and asks, “Why does he have two USB speakers?” What are the odds of anyone buying two USB speakers a few days apart and have it echoed in a PODCAST thousands of miles away? Stuff that appears on this blog do get mentioned on their show. That could be explained away by the fact Gitmo Detox Press (http://inthemorningzen.wordpress.com/) is following this blog (the only one to do so). This guy seems to be a big fan of the show and also of BitSync technology that Curry occasionally talks about. How do they get to know stuff that happens offline? (I did blog about the speakers much later.) I am not sure. So, I started listening to old episodes to see how long this has been going on. Not much there. It seems to have started only recently. 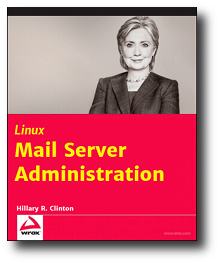 However, I discovered something else that was curious. All these years, Curry seems to have been sucking up to Freemasons in a fashion not different from others in the entertainment business. (If you follow Vigilant Citizen website or the Vigital Citizen RSS Feed, you will know how to spot the howlers.) Anyway, here is an excerpt from end of episode #134. Rainbow children is how members of the International Order of the Rainbow for Girls are referred. It is a club meant for female offsprings of Freemasons. I am not sure if Dvorak is a Freemason but it was he introduced titles such as Knights to listeners of the show. 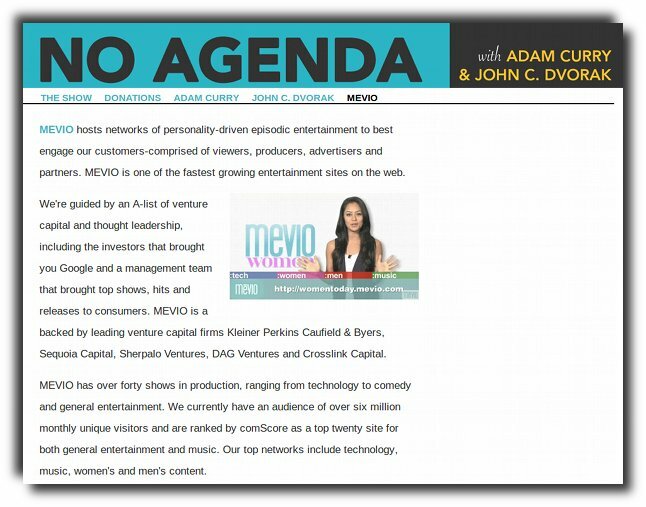 BTW, both Dvorak and Curry are principals at a video hosting site called Mevio. It has received funding from venture capital firms including Kleiner Perkins and Sequoia Capital, the same people who have funded Google. Curry says he is not taking a salary and dividends from Mevio and will instead wait for it to make money for other investors. Until then, he has taken a vow of poverty. Very well, then. Adam Curry is a co-founder of Mevio. John C Dvorak is a Vice President there. The firms has received millions from venture capital firms. Update (14/12/13): Curry reads parts of the article in episode #573 and says this post has “gone viral.” In other news, over the last few days, my Internet connection has been flaky and my computer has developed a boot issue, exactly as Dvorak described as having happened to him in that episode! It is another TWO of those No Agenda Show-linked coincidences. Today, I woke up at 2 am in the night and started working on my computer. After half an hour, I got it to boot properly and decided to check if the post had indeed gone viral. I found one mention – a podcast by some Freemasons in Australia mentioning the show. Later, when I check into WordPress, there is a comment asking me to listen to the same podcast. There has been a lot of this lately, which is why the heading of the comments section says that all comments on this blog will be moderated by government agents. I could choose a better pastime wrestling polar bears or pulling tooth from the jaws of great white sharks. I think I have made my point about the Show and the matter needs no further elaboration. You will not hear me on the subject anymore. End of story. Adios, mofos! Freemasonry is all about networking with people who have influence – big or small. 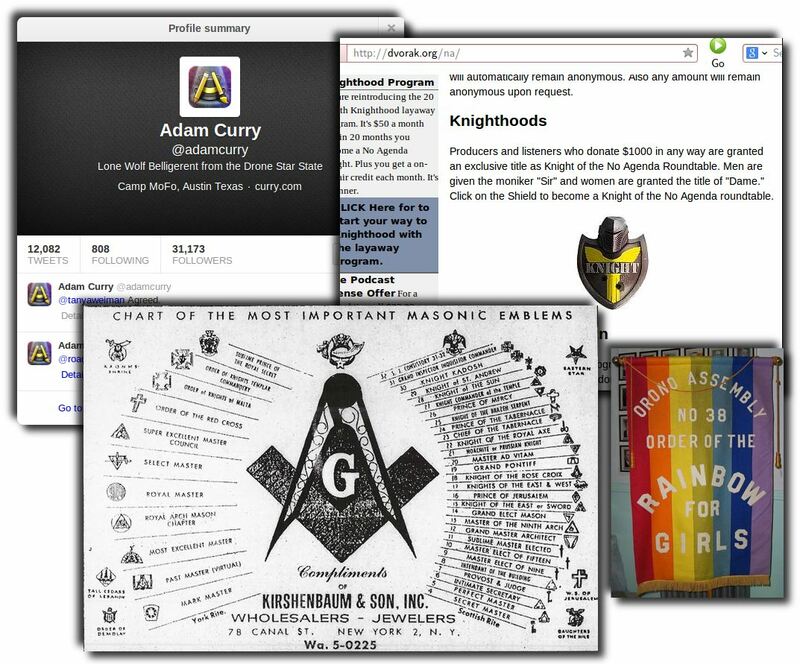 Freemasonry treasures access to people with power – people in government, judiciary, politics, military, police, education, arts, and even pimps and prostitutes. To maintain the illusion of exclusiveness, Freemasonry have evolved an elaborate collection of bizarre rules, weird rituals, secret oaths, garbs, and horse-crap neo-religious literature. They have also liberally borrowed symbolism and practices from established religions and faiths from all over the world. Some stupid people turn this on its head and claim that these (borrowed) features is evidence of the influence of Freemasons in the making of those faiths! It should also be noted that Freemasons have also created new faiths and cults that do not advertise themselves as related to Freemasonry – Mormonism (Church of Latter Day Saints), Jehovah’s Witness, Church of Scientology, etc. You can identify these religions by studying the history of its founders and their use of religious symbology. To fool the uninformed public, Freemasons claim that they keep and worship the holy books of top world religions in their lodges. A closer study puts paid to this claim. Freemasons have published a mountain load of material denouncing Jesus Christ and Christianity and have also documented how they have took over subverted his Church, see Manly P Hall, Albert Pike, Aleister Crowley of Church of Satan fame, Helena Blavatsky aka Madame Blavatsky, et al. Religion, monarchy, and nationalism are impediments to a monolithic worldwide government and Freemasonry seeks to take over and destroy these impediments bit by bit. The pecking order inside Freemasonry is different from the one established in the outside world. A person might be high and mighty in the outside world but when he joins the group, Freemasonry seeks to cut him down to size using a system of demeaning rituals and gags. 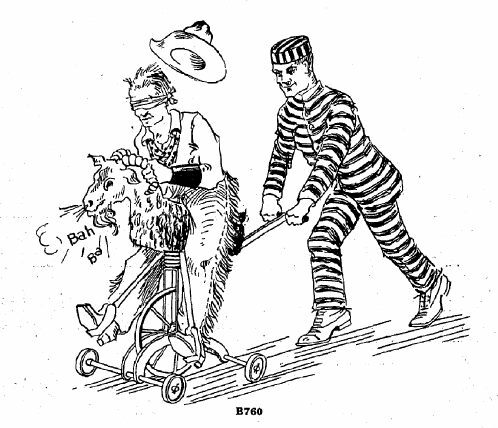 Illustration showing a mechanical goat contraption used to humiliate new members of secret societies (“fraternal orders”). 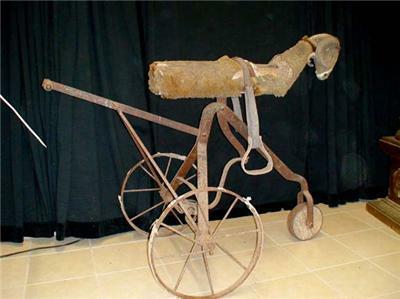 It is quite likely that Jawahar Lal Nehru, George Washington, almost all the signatories to the United States Declaration of Independence, and most American Presidents must have been made to ride this thing. After being shamed in such ways, these giants among men would be under intense pressure to restore their wounded pride. They would do anything – murder, treason or even genocide – to win back the respect of their peers in the Freemasonry lodge. 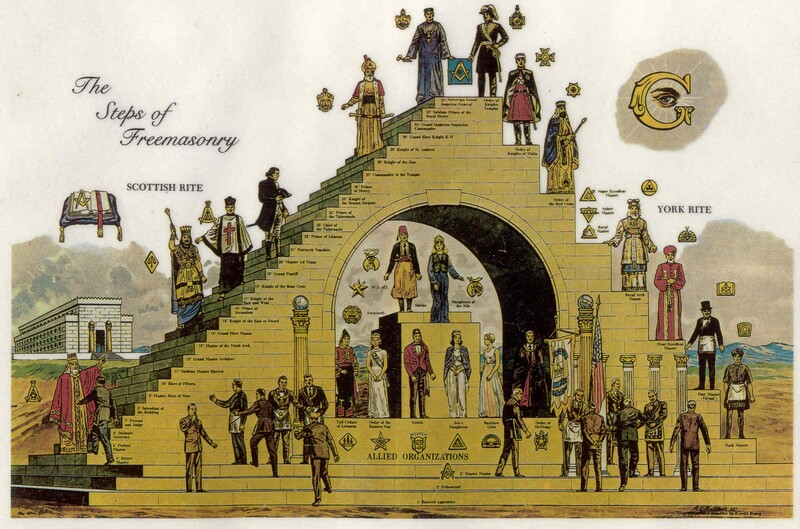 To extract the maximum value from its prisoners (members), Freemasonry is organized around a pyramid of 33 degrees that “aspiring” members could seek to rise up. Fellow members would only know that a member has been promoted to a higher degree. They would not know what crime or folly the member had committed to achieve it. Most Freemasons die away before they rise above a few degrees. Only the most foolish, most treacherous and most fiendish rise to the top. The 33 levels of the hierarchical pyramid of Freemasonry is used to extract maximum value of the members over their lifetime. Freemasons are supposed to look out for each other and help one another. There is both truth and falsehood in this. Fellow members may help in small matters. But the legion of kings, dictators, politicians, soldiers, spies, murderers, and other fools who have lost their lives because of this hope is way too big. Even when lined up to be shot or have a noose put around their neck, they would still be waiting for help to arrive. This is how secrets die and conspiracies survive. In some lodges or in some levels, gags took up on more evil nature. Real human beings and even babies were bound, tortured, and killed. It is from these lodges, that mass-murdering psychopaths (Jack, the Ripper, or Andreas Breivik) or assassins (Archduke Fredinand) have come. Many critics of Freemasonry believe these rituals are an offshoot of blood rituals and occult practices of ancient Jews of Palestine. Freemason and Jewish literature claim they were subject to various forms of torture during their Babylonian exile. Truth, however, is that they put everything in words during and after their exile. These rituals were part and parcel of Jewish life from their days from before exile. There is a lot of misinformation about Freemasonry. It does not rule the world. It is one of many such groups under the employ of the Rothschilds. It is Rothschilds who rule the world – not individual groups like Freemasonry, Jesuits, Bilderbergers, Israel, United Nations, fairies, aliens, reptilians, etc. Everyone plays their part. They don’t know how it works or comes together. They just have to do what they are told to do. 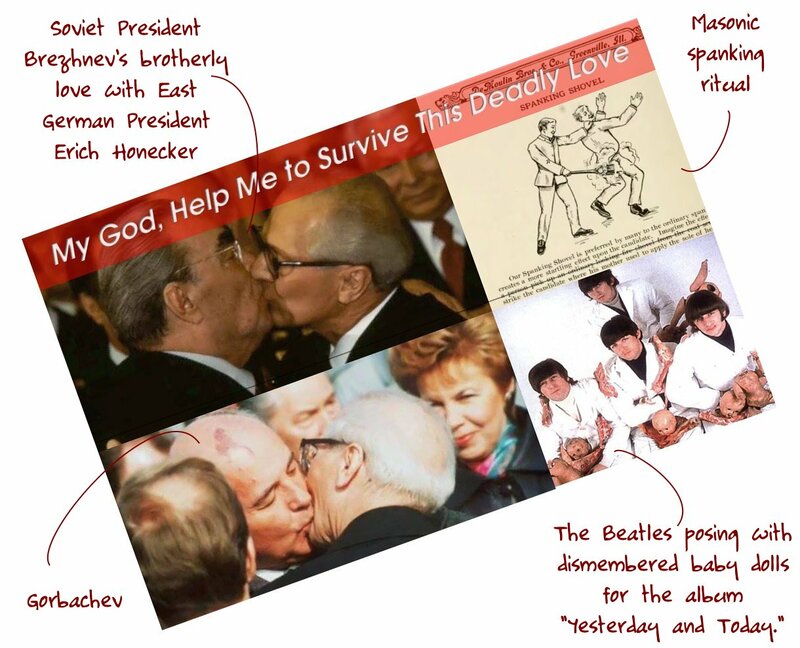 Soviet President Brezhnev liplocks with Eastern German leader Erich Honecker and so does Gorbachev at a later point in time. The Beatles pose with dismembered baby dolls. 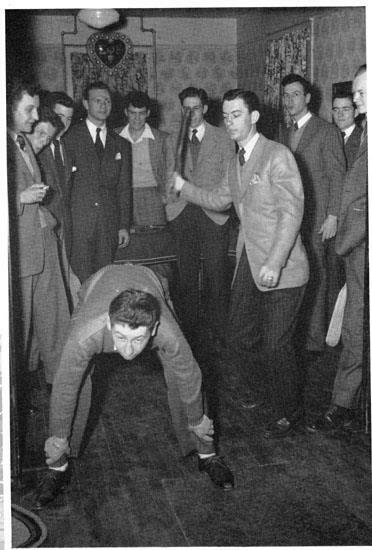 A spanking freemasonic ritual. Elsevier journal editor Richard E Goodman did work for Monsanto and threw out Seralini GMO rat tumour paper. So, what?